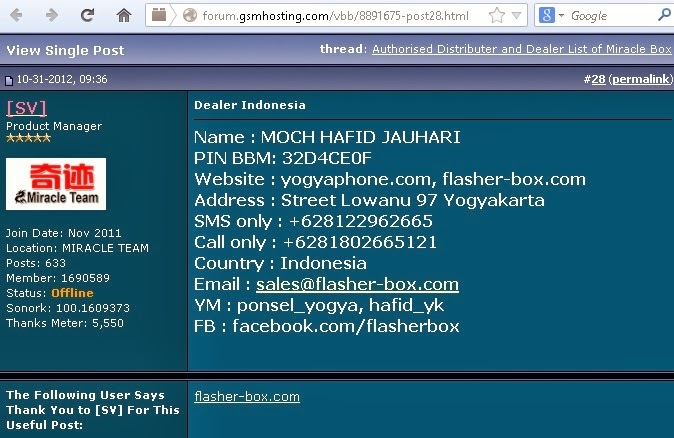 Discussion in 'Flasher-Box' started by jogjaflasher_com, Oct 15, 2012. Mohon maaf Pin blackberry pindah ke 2B278189 (31-3-2014), apabila sudah terdaftar di pin lama dan telah mendapatkan BC rutin, Pin diatas tidak perlu di-invite. Update pergantian pin dapat diikuti di www.flasher-box.com. cross v6 write flash by miracle box,,, done,,, thanxs Yogyaphone Yogyakarta — feeling excited. ✔ 1.MTK Add Nokia 220 write (10th). ✔ 2.MTK Improve Nokia 220 format (10th). ✔ 3.SPD Add 8810/6820 new boot support. ✔ 4.SPD Improve Nand write. ✔ 5.Android Improve Clear Code (facelock,Voicelock). ✔ 6.Android Improve WIPE Method. ✔ 7.Android ROOT Add new phone support. ✔ 8.Android Improve Samsung flash.